Interesting forecast for the race with the prospect of the wind changing round over night. Down wind, down tide start and a good soaking for the foredeck as we crossed the start line on port with Alchemist just in front on starboard. Good leg down the Solent until we got to Yarmouth and fell into a hole so that the rest of the fleet could catch us up but managed to get away again as we stayed close to the Island out of Hurst with Xara & Raffles were over on the Shingles side of the channel. Wind turned cyclonic about 8 o'clock and spent some time going nowhere but ended up putting the spinnaker up again and once jibbed we started to move after about 3 quarters of an hour. Good over night run and got to the top of the Little Russell in time to catch the tide and hoped the wind would hold to the finish as we had heard Xara radio in one mile from the finish. 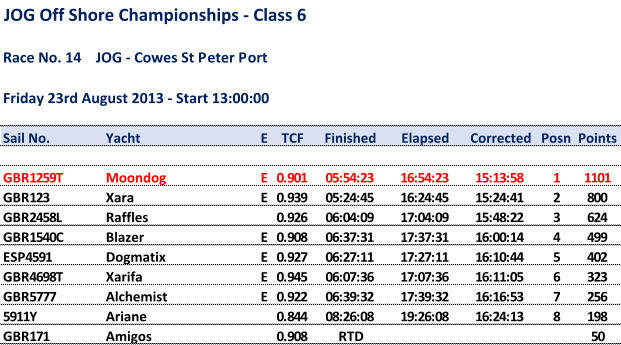 Finished just before six and some quick calculation on the iPad confirmed our first position in class six and looking at the full results we were also the first out of all 4 classes. Excellent Vin d'Honneur by the States of Guernsey in the Information Centre.